The first Town Hall for the Superintendent Nominees was held at Cucamonga Christian Fellowship on Thursday, January 18th, 2018. The faith-filled time of conferencing was preceded with an hour of food and fellowship, as the superintendent nominees made their way around the room to greet pastors and lay leaders present for the event. Officially, the event began with a time of worship led by CCF’s own worship team. As worship drew to a close, Superintendent Denny Wayman introduced Bishop Matt Thomas, who gave the opening remarks. The agenda was set to include nominee presentations, a question and answer time, and a conclusion of voting and annual conference information. The nominee presentations gave each prospective superintendent — Fraser Venter, Charles Latchison, and Glen Prior — the opportunity to share part of their story and their vision for the superintendency team. First was Charles Latchison, who spoke of many seeds being sown into his life and this nomination being part of the fruit of those seeds. 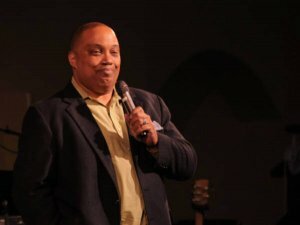 His unique gift to the superintendent team is his experience of starting over in ministry, and seeing God’s restoration work powerfully in his life. 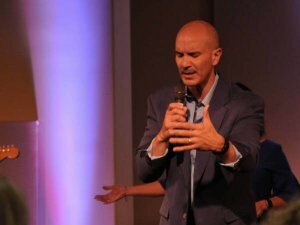 Then, Glen Prior shared about his experience in the freedom to fail in ministry, and the transformative idea that when there’s an open door, we are meant to walk through it. He conveyed the three E’s of ministry that he lives by: exalt the name of Jesus, equip the saints for deployment and discipleship, and expand the kingdom by caring for the health and safety of the church. Finally, Fraser Venter relayed his own story of saying yes in transitional moments of his life. He values hearing each person’s voice and answering the question of who we will become, as a community. What seemed to be the common elements were the need to be present and listen more, and to move forward in healthy community — doing things together, by the guidance of the Holy Spirit. After hearing from each nominee separately, the three joined together for a question/answer panel. Several questions were asked of the three nominees: How would each go about balancing their local churches, superintendency, and family life? 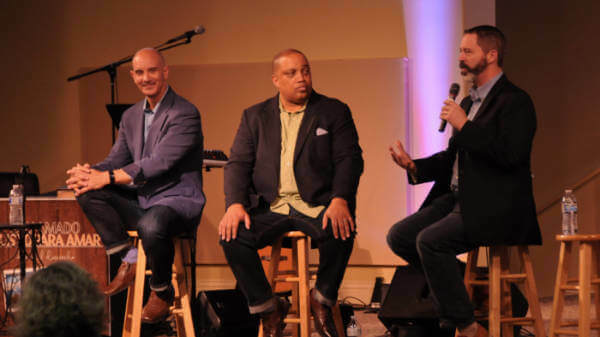 What was their plan to foster closer relationships between regional pastors? Was there a plan for reconciliation within the denomination? What would this team bring to the Latino church? Many of the answers to these questions would later be explained when, if elected, the team would present their vision at Annual Conference. What seemed to be the common elements were the need to be present and listen more, and to move forward in healthy community — doing things together, by the guidance of the Holy Spirit. 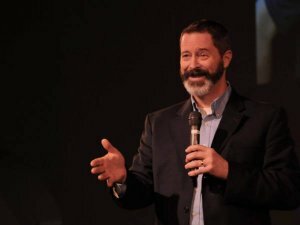 To close the town hall, Superintendent Denny Wayman announced that the Free Methodist church had grown in every area of life in the church in 2016, with expectancy for even more growth in 2017. He also relayed the plans in process for the current and elect superintendent teams to work together for Annual Conference 2018. As all who were present gathered at the altar, Pastor Colleen Hurley-Bates gave the closing prayer and benediction, inviting the Holy Spirit to work powerfully in the nominated team and in the Free Methodist church as a whole, empowering men and women to carry out the mission of God with justice, compassion, and grace.